Home » Is ACCESS for Me? ACCESS is door-to-door, advance reservation, shared–ride transportation provided throughout Allegheny County and to destinations in adjoining counties within 1.5 miles of the Allegheny County. As a coordinator of paratransit service throughout Allegheny County, ACCESS offers several special discount programs for individual riders, as well as providing service for groups, human service agencies and other organizations that purchase transportation for their clients. ACCESS is also open to the general public at full fare rates. Reservations for ACCESS service are made in advance. To place trip reservations, riders call the special ACCESS telephone number of the service provider in their neighborhood. 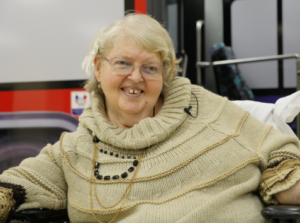 In addition to the basic paratransit service offering, ACCESS provides hand-to-hand service for individuals who require constant supervision and service modifications. Some ACCESS passengers require a higher level of supervision and cannot be left unattended. These customers carry a special code in their file alerting drivers to ensure they are handed off to a responsible person and cannot leave the passenger unless there is someone available to receive them both at home and at their destination. An elaborate safety net is in place in the event of a problem. Call ACCESS at (412) 562-5353 for more information. Drivers are trained to report incidents which are individually investigated by ACCESS. Although they may not be strictlytransportation-related issues, ACCESS works with its network of community providers to resolve individual, personal issues including lack of accessibility to the house, a change in condition (onset of confusion) signs of abuse, and problems with personal hygiene or nutrition. If there is an ACCESS rule or policy that, due to your disability, makes it difficult or prevents you from using the service, you may call or write to the central ACCESS office to discuss your situation. When at all possible, requests should be made in advance and will be considered on a case by case basis as long as they are reasonable and do not create a direct threat to others or a fundamental change to basic ACCESS service. As a coordinator of paratransit service throughout Allegheny County, ACCESS offers several special discount programs for individual riders, as well as providing service for groups, human service agencies and other organizations that purchase transportation for their clients. Our most frequently used programs are outlined in the Programs Options Chart you may view or download by clicking the link below. The ACCESS ADA Program is a service offered by Port Authority of Allegheny County for people with disabilities, regardless of age, who are functionally unable to independently use Port Authority bus service, either all of the time or under certain circumstances. Evaluations are held several times each month in downtown Pittsburgh for the ACCESS ADA Program. Appointments are required and may be made by calling ACCESS. Assistance with transportation to the evaluation is available upon request. The ACCESS 65 Plus Program is a special program which provides an 85% discount on ACCESS fares for anyone aged 65 or over. Funds for the ACCESS 65 Plus Program discount are provided by the Pennsylvania Lottery through the Pennsylvania Department of Transportation. Applicants for the ACCESS 65 Plus Program must complete a short application and present proof of age either at the ACCESS office in downtown Pittsburgh, through the mail or at centers conveniently located in many neighborhoods throughout Allegheny County. Call ACCESS to find the 65 Plus registration center nearest to you and its schedule. People with a valid government issued photo ID may apply through the mail. Anyone with a disability is eligible for the Connections Program. Use Connections to get to and from Port Authority bus stops if there is no stop within ¾ air mile from the origin or destination. This is called “Feeder Service.” This service will also allow riders to take a direct ACCESS trip if the trip on the bus is less than 5 miles and would take more than 90 minutes or take a direct trip on ACCESS if there is bus service within ¾ mile, but not within an hour of the time of travel. Driver’s License, Government Issued Photo ID Card, PACE Card, Birth Certificate, Passport, Immigration/Naturalization Papers, Military Discharge Papers, verification from Social Security Administration. Medicare Cards are not acceptable. Agencies can choose to sponsor ACCESS rides for their participants and pay all or part of the fare. There are over 140 agencies with ACCESS billing accounts. They use ACCESS instead of operating their own vehicles –coordination and ride sharing makes the service more efficient and eliminates duplication!